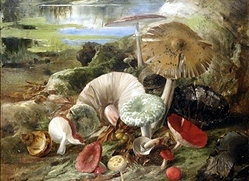 This section includes still lifes, mushroom gathering scenes, studies, portraying mushrooms in a large number of contexts. The dates following the artist's name are often those of his period of greatest creativity, not necessarily the dates of his birth and death. Some entries overlap with the post-1950 period and may also be found in that file. Click on any entry below to enlarge. Mushroom description: At least one mushroom in a small declivity in the soil below the head of the cream colored standing doe. There may be another species below. Medium: Oils on canvas; size: 80 x 60 cm. Medium: Oils; size: 42 x 31 in. Reference: Christie's auction, Sale 2744. 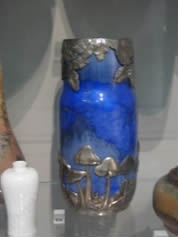 20th Century Decorative Arts. 23 May 2007, Amsterdam. Mushroom description: Several carvings of edible mushrooms probably chanterelles, Macrolepiota procera, Boletus edulis on the stone façade of the ? Medium: Oils on canvas; size: 45.7 x 60.9 cm. Medium: Oils on panel; size: 7.8 x 58 cm. Reference: Artcurial-Briest-Poulain-Le Fur auctions, December 6, 2005, lot 74. Medium: Tempera on gesso-prepared panel; size: 23 x 28.5 cm. Reference: Peterson, Roger Tory and Peterson, Virginia Marie. Audubon's Birds of America: The Audubon's Society Baby Elephant Folio. New York: Abbeville Press. (Revised edition) 1991. Medium: Pastel on canvas; size: 23.2 x 31.1 in. / 59 x 79 cm. Medium: Oils on canvas; size: 16.9 x 13.8 in. / 43 x 35 cm. Mushroom description: Group of Hygrocybe sp. Medium: Oils on canvas; size: 55 x 72 cm. Reference: Kunsthaus am Museum Carola Van Ham, Köln. Auktion 54, 1973. black/white illustr. Tafel 129. Reference: Pen As Pencil: Drawings and Paintings by British Authors. Europalia 73 - Great Britain. (black/white illustr. No. 37B) Exhibition arranged by the National Book League in co-operation with the British Council. Catalogue of an exhibition held at Internationaal Cultureel Centrum (Antwerp), 6 Oct. - 4 Nov. 1974, Bibliothèque Royale, Brussels. Illustration of Russian fairy tale called "Maria Morewna"
Medium: Watercolor and body color; size: mounted oval, 18.5 x 26 cm. Medium: Watercolor on paper; size: 20 x 20.5 cm. Medium: Watercolor and bodycolor; size: 16.25 x 20 cm. Medium: Watercolor and bodycolor; size: 12 x 19.5 cm. Medium: Pencil, watercolor, bodycolor; size: 25.5 x 29 cm. Medium: Watercolor; size: 20 x 35.5 cm. Medium: Watercolor and gouache; size: 27.3 x 22.2 cm. Medium: Watercolor enhanced with bodycolor; size: 16 x 22 cm. Medium: Watercolor and bodycolor; size: 16 x 22 cm. Medium: Watercolor enhanced with bodycolor; size: 12.5 x 22 cm. Reference: Artcurial-Briest-Poulain-Le Fur auctions. December 6, 2005, lot 74. Last seen on Gabrius website. Medium: Watercolor on paper; size: 39.5 x 54.7 cm. Reference: Hardouin-Fugiers, E. Les Peintures de Natures Mortes en France au XIX siecle. Paris: LÉdition de l'Amateur. Location: Present location Unknown. First exhibited at Uffici Palazzo dell'arte al Parco in Milan, Italy, summer of 1957. Shown in Philadelphia Museum of Art in 2003. Medium: Oils on canvas; size: 80 x 100 cm. Medium: Oils; size: 52.5 x 88 cm. Medium: Oil on canvas; size: 19.5 x 33.2 cm. Medium: Oils on cloth; size: 48 x 58 cm. Mushroom description: Cantharellus cibarius, Lactarius sp. Reference: Okkonen, O. Die finnische Kunst. Berlin: W. Limpert-Verlag, 1943. Mushroom description: Single upside down, Agaricus sp. Medium: Oils on canvas; size: 78 x 99 cm. Medium: Oils on canvas; size: 68 x 45 cm. Reference: Larkin, David, Editor. The Fantastic Creatures of Edward Julius Detmold. Introduction by Keith Nicholson. London and Sydney: Pan Books Ltd, 1976. Medium: Color lithography; size: 56.7 x 75.2 cm. Medium: Woodcut on woven paper; size: 37.3 x 27.8 cm. Medium: Oils on canvas; size: 46.3 x 37.5 cm. Medium: Oils on canvas; size: 40.6 x 61 cm. Mushroom description: In the right corner, below, probably a Psathyrella sp. Reference: 1. Robert S. Marks (letter to D. Thoen). 2. Brissoni, "Antonio Fasan".., 82 plates (many in color). 1969. Medium: Watercolor; size: 22.9 x 17.8 cm. Medium: Oils on cardboard; size: 61.5 x 55 cm. Reference: Lexicon der Kunst. Freiburg. 1985. Medium: Oils on canvas support; size: 405 x 510 mm. Medium: Oils on canvas; size: 35 x 24 cm. Medium: Oils on board; size: 47 x 33 cm. Medium: Oils on canvas; size: 56.4 x 85.8 cm. Medium: Oils on canvas; size: 46.7 x 56 cm. Medium: Oils on canvas; size: 37 x 57 cm. Medium: Oils on panel; size: 41.9 x 28.5 cm. Mushroom description: Group of Macrolepiota sp. Medium: Oils on board; size: 13 x 17 cm. Medium: Oils on panel; size: 26 x 36 cm. Medium: Oils on panel; size: 44.5 x 33 cm. Medium: Oils on canvas; size: 48.8 x 38 cm. Medium: Oils on canvas; size: 55.6 x 85.6 cm. Medium: Oils on canvas; size: 58 x 78 cm. Medium: Oils on panel; size: 29.5 x 46 cm. Medium: Oils on canvas; size: 45.1 x 57.2 cm. Medium: Oil on canvas; size: 45 x 55 cm. Medium: Oils on canvas; size: 160 x 90 cm. Gisenbert, K (given names?). German? 19th -20th Century? Golynski, Vassili. Russian. 19th century? A group seated and lying in a little cleared space in the forest and listening, rather incredulously, to the eager assertions of the youngest that she knows where a still more fruitful harvest of fungi may be found. Medium: size: 21 x 17.8 cm. Medium: size: 64x 53 cm. Medium: Oils on canvas; size: 32.7 x 43.5 cm. Medium: Oils on panel; size: 18.6 x 24.8 cm. Mushroom description: Indistinct mushrooms in a basket. Marine scene. Reference: Pen As Pencil: Drawings and Paintings by British Authors. Europalia 73 - Great Britain. (black and white illustration. No. 37B) Exhibition arranged by the National Book League in co-operation with the British Council. Catalogue of an exhibition held at Internationaal Cultureel Centrum (Antwerp), 6 Oct. - 4 Nov. 1974, Biblioth?que Royale, Brussels. Hornel, Edward A. Scottish. Born in Australia. 1864-1933. Medium: Oils on panel; size: 46.3 x 60.3 cm. Medium: Oils on canvas; size: 50 x 60 cm. Note: This was Hosmer's most popular piece. Hosmer produced several copies of this model and its financial success allowed Hosmer to pursue sculpture as a career. Medium: Oils on canvas, arched top; size: 68.7 x 123.8 cm. Reference: 1. 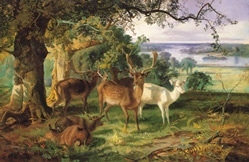 Postcard, printed in Great Britain by Henry Stone & Son (Printers) Ltd., Banbury. 2. Postcard, printed in Great Britain by Herbert Walker & Son (Printers) Ltd., Shipley, West Yorkshire. Medium: Oils on canvas; size: 46.5 x 63.5 cm. Medium: Oils on canvas; size: 73 x 92 cm. Reference: La peinture anglaise-XVIIIe et XIXe si?cles. Palais du Louvre. 1938. Medium: Oils on canvas; size: 46 x 38 cm. Mushroom description: Brown mushrooms, agarics or boletus ? Reference: Ebert-Schifferer. Geschichte des Stillebens. Munich. 1998. Medium: Oils on canvas; size: 32.5 x 40 cm. Mushroom description: Anisomyces odoratus, Trametes versicolor, Tyromyces sp. Medium: Watercolors and ink, varnished, on board (Aquarell und Tinte, gefirnisst, auf Karton); size: 43.5 x 33 cm. Reference: 1. Paul Klee. La Septi?me Face du D? Filipacchi, Collection. 1975 (color illustrations). 2. Transparency. 3/ Color postcard (Verlag Offentliche Kunstsammlung, 4010 Basel, Switzerland) in Thoen's collection. Reference: Exhibition catalog. Galerie Schlichtenmeier. 1996. Medium: Oils on canvas laid down on board; size: 27 x 23 cm. Medium: Gouache and watercolor on paper; size: 33 x 25 cm. Medium: Oils on canvas; size: 101.5 by 76 cm. Note: Sotheby's Auction. Lot sold. Hammer price with buyer's premium: 356,500 gbp. Medium: Triptych of oils on canvas; size: 175 x 83 cm. Medium: Etching; size: 9.8 x 22.2 cm. Reference: Brauner. Max Liebermann. Berlin. 1986. Medium: Oils on canvas; size: 43 x 58 cm. Medium: Watercolor on paper; size: 38 x 50 cm. Reference: Marcel Duchateau. 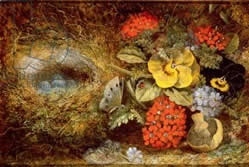 Les Fruits de la Terre dans la Peinture Belge (1850-1985). Medium: Watercolor; size: 27.3 x 19.8 cm. Reference: Postcard (Den Kongelige Kobberstiksamling, Department of Prints and Drawings) in Thoen's collection. size: 41.5 x 45 cm. Medium: Oils on canvas; size: 63 x 60.5 cm. Medium: Oils; size: ca. 40 x 60 cm. Medium: Collage on cardboard; size: 12.5 x 14.5 cm. Medium: Oils on canvas; size: 32 x 36 cm. Medium: Oils on canvas; size: 45 x 84 cm. Medium: Watercolor on paper; size: 25.4 x 35.5 cm. Reference: Murken-Altrogge, Christa. Paula Modersohn-Becker: Leben und Werk. Cologne, Germany: Dumont Buchverlag. 1980. Reference: Murken-Altrogge, Christa. 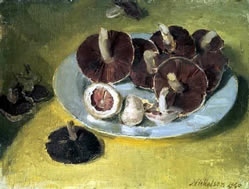 Paula Modersohn-Becker, Leben und Werk. Cologne, Germany: Dumont Buchverlag. 1980. Medium: Oils on canvas; size: 48 x 70 cm. Reference: Anonymous. 1992. 20 Gemeenteprifil POM. Antwerp. Medium: Watercolor and lead pencil on gray board; size: 32 x 25 cm. Reference: Mossa, Gustav Adolf. L?Oeuvre Symboliste 1903-1918. Catalogue from the Paris-Mus?s, 1992. Reference: Herder. Grosse Enzyklopedie der Malerei. Freiburg, Germany. 1978. Medium: Oil on canvas; size: 125.5 x 179 cm. Reference: Cansey, Andrew. Introduction to Paul Nash's Photographs. Documents and Images, Tate Gallery, 1973. Medium: Watercolor and chalk; size: 11.5 x 15.5 in. Reference: Paul Nash. Paintings and Watercolours. Tate Gallery, 1976. Medium: Oils on canvas; size: 76.2 x 50.8 cm. Note: G. Ainsworth in the History of Mycology, Cambridge Univ. Press, 1976 edition, mentions: "... the emotive use of agarics by Paul Nash in the twentieth [century]." Medium: Oils on canvas board support; size: 34.9 x 45.1 cm. Medium: Oils on canvas; size: 48.2 x 55.9 cm. Medium: Oils on panel; size: 65 x 53 cm. Medium: Oils on canvas; size: 115 x 93 cm. Medium: Oils on canvas; size: 54.5 x 66 cm. Mushroom description: Basket with small capped mushrooms, including Lactarius sp. Reference: Images de Jacques Prevert. Le Monde des Grands Mus?es. Novembre-D?cembre 1973. Filipacchi Ed. 1973. Medium: Watercolors; size: 54 x 61 cm. Medium: Oils on canvas; size: 48.5 x 64 cm. Reference: Genthon. Die grosse Zeit der neuen franz?sische Malereien. Budapest. 1964, 1975. Medium: Color woodcut; size: 23 x 33 cm. Medium: Oils on panel; size: 60.5 cm x 45.5 cm. Reference: Cabral Moncada Leiloes. d?c. 2002. Medium: Oil on canvas; size: 50 x 81.5 cm. Medium: Oils on canvas; size: 71 x 59 cm. Reference: Boyle-Turnder, Edita S.A. Paul Serurier, Peintre de la Bretagne. Lausanne. 1988. Mushroom description: Ganoderma lucidum s.l. Reference: Stern, Harold P. Birds, Beasts, Blossoms and Bugs - The Nature of Japan. Harry, N. Abrams, Inc. Publ. New York: 1976. Reference: Russian Painting. Aurora Publ. St. Petersburg. Reference: Schuvalova. I. Shishkin (Great Painters Series). Leningrad. 1983. Reference: Schuvalova. I. Shishkin (Great Painters Series). Leningrad 1983. 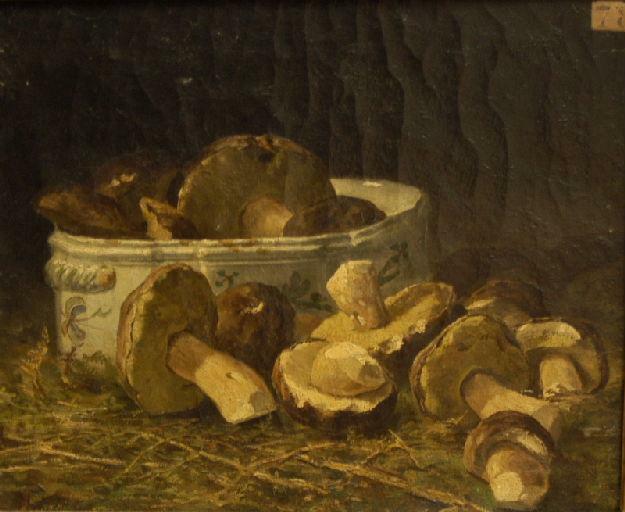 Reference: Schuvalova, I. Shishkin (Great Painters Series). Leningrad. 1983. Medium: Oils on canvas; size: 17 3/4 x 13 3/4 in. Mushroom description: Couple on a wooded path. Man with basket full of boletes (possibly); woman holding a mushroom. Reference: Sotheby's Preview, June/July 1990. Medium: Collage of newsprint on blue woven paper; size: 23.2 x 15.5 cm. Medium: Oils on canvas; size: 41.3 x 99.0 cm. 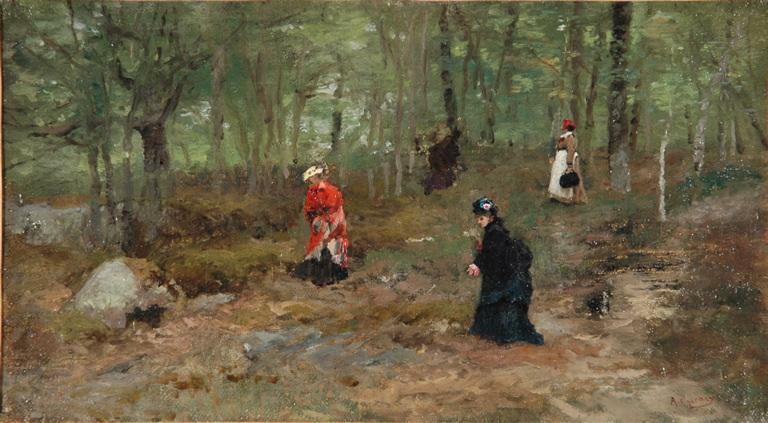 Note: Two women in a field, one with a basket, the other apparently with mushrooms in apron. The mushrooms are not visible. Medium: Oils on canvas; size: 17.9 x 24.6 cm. Medium: Oil on canvas, 81.5 x 99 cm. Medium: Bronze with ivory head; size: height: 17.5 cm. Medium: Watercolor; size: 8 3/8 x 6 3/8 in. Medium: Watercolor; size: 14 3/4 x 22 3/4 in. size: 170 x 136 cm. size: 100 x 165 cm. Reference: "Toyen." Filipacchi ?d. 1974. Note: Toyen, who rejected her name and chose to pursue her career as an artist under an assumed name, was the leading Czech surrealist and one of the many women who played important roles in the International Surrealist movement. A feminist before the name (and in Czech, her assumed name, does not have a gender), she rejected any suggestion that she play a woman's role and endorsed the anarchist movement. Medium: ? ; size: 38 x 61 cm. Medium: Oils. Also a wood carving by H. A. Emil Ostade. Medium: Oils on canvas; size: 50 x 61 cm. Medium: Oils on panel; size: 26 x 35 cm. Medium: Oils on canvas; size: 100 x 100 cm. Reference: Du R?alisme ? l'Expressionisme dans l'Art Belge. Collection du Cr?dit Communal. Medium: Oils on canvas; size: 31 x 41 cm. Medium: watercolors; size: 27.5 x 21.5 cm. Mushroom description: Flowers (Adonis, Corylus, Salix, Viola, Vinca, Fritillaria, Bellis,...), apple and four ascocarps of Sarcoscypha sp. Reference: Seen in Bonhams Catalog. The Flower and Garden Sale. Wednesday 22 may 2002, Chelsea, London. Medium: Oils; size: 130 x 170 cm. Reference: 1. Cercle Artistique et Litt?raire - Bruxelles. Exposition Jubillaire 1847 - 1922. Catalogue. Painting no. 239. 2. L'Art Vivant en Belgique, 3? Ann?e. No. 67. Octobre 1927. Reference: Grente, Christian. Collections d?vOils?es Arts Actualit? Magazine. No.68, sept. 1996. Medium: Oils on panel; size: 22.3 by 28 cm. Medium: Not available; size: 32.5 x 44 cm. Medium: Oils; size: 27 x 39 cm.